Mary works as a waitress in a restaurant for night shifts. For the entire shift, Mary stands and roams around the dining place to assist customers. In the morning, she sleeps the entire day away and can hardly have a meal. She started to notice her pallor three months into her job. She also gets tired easily and feels palpitations after a tiring shift. Once, she had difficulty in breathing and had to be rushed to the emergency room to be treated. Anemia is a condition that is slowly rising in cases across all countries. Every age and every stage can be affected by anemia, and though others may consider this as a simple condition, it could blow out of proportion if left untreated. Anemia is a condition in which the hemoglobin concentration is lower than normal. Anemia reflects the presence of fever than the normal number of erythrocytes within the circulation. Anemia is not a specific disease state but an underlying disorder and the most common hematologic condition. A physiologic approach classifies anemia according to whether the deficiency in erythrocytes is caused by a defect in their production, by their destruction, or by their loss. Hypoproliferative anemias. In hypoproliferative anemias, the marrow cannot produce adequate numbers of erythrocytes. Hemolytic anemias. There is premature destruction of erythrocytes that results in the liberation of hemoglobin from the erythrocytes into the plasma; the released hemoglobin is then converted into bilirubin, therefore bilirubin concentration rises. Bleeding anemias. Bleeding anemias are caused by the loss of erythrocytes in the body. The pathophysiology of anemias is drawn according to the cause of the disease. Decreased erythrocyte production. There is decreased erythrocyte production, reflected by an inappropriately normal or low reticulocyte count. Marrow damage. As a result of marrow damage, inadequate production of erythrocyte occurs due to the medications or chemicals or from a lack of factors. Premature destruction. Premature destruction of erythrocytes results in the liberation of hemoglobin from the erythrocytes into the plasma. Conversion. The released hemoglobin is converted in large part to bilirubin, resulting in high concentration of bilirubin. Erythropoietin production. The increased erythrocyte destruction leads to tissue hypoxia which stimulates erythropoietin production. Increased reticulocytes. This increased production is reflected in an increased reticulocyte count as the bone marrow responds to the loss of erythrocytes. Hemolysis. Hemolysis is the end result, which can result from an abnormality within the erythrocyte itself or within the plasma, or from direct injury to the erythrocyte within the circulation. It is usually possible to determine whether the presence of anemia is caused by destruction or inadequate production of erythrocytes on the basis of the following factors. Response. The marrow’s response to decreased erythrocytes as evidenced by an increased reticulocyte count in the circulation blood. Proliferation. The degree to which young erythrocytes proliferate in the bone marrow and the manner in which they mature as observed in the bone marrow biopsy. Destruction. The presence or absence of end products of erythrocyte destruction within the circulation. In general, the more rapidly the anemia develops, the more aggressive is its symptoms. Decreased hemoglobin. A patient with anemia has hemoglobin levels between 9 to 11 g/dL. Fatigue. Fatigue occurs because there is inadequate oxygen levels in the tissues that should have been carried by hemoglobin. Tachycardia. The heart compensates for the decrease in oxygen by pumping out more blood so it can reach peripheral tissues in the body. Dyspnea. Difficulty of breathing occurs because of the decreased concentrations of oxygen in the blood. With decreased hemoglobin that serves as the pigment in the red blood cells, the patient may become pale because of the lack or decrease in the pigment that is hemoglobin. To prevent anemia, lifestyle modifications must be made. Diet rich in iron. Ingestion of iron-rich foods could help prevent anemia because it adds to the hemoglobin in the body. Iron supplements. Iron supplements can also be taken to increase the hemoglobin levels in the body. Heart failure. As the heart compensates by pumping faster than the normal rate, the heart muscles gradually weaken until the muscles wear out and the heart fails to function. Paresthesias. Paresthesias develop when the muscles do not have enough oxygen delivered to them. Delirium. Insufficient oxygen in the brain results in delirium and is considered a fatal complication of anemia. A number of hematologic studies are performed to determine the type and cause of anemia. Blood studies. In an initial evaluation, the hemoglobin, hematocrit, reticulocyte count, and RBC indices, particularly the mean corpuscular volume and red cell distribution width are taken to assess for the presence of anemia. Iron studies. Serum iron level, total iron binding capacity, percent saturation, and ferritin, as well as serum vitamin B12 and folate levels, are all useful in diagnosing anemia. CBC values. The remaining CBC values are useful in determining whether the anemia is an isolated problem or part of another hematologic condition. Management of anemia is directed towards correcting or controlling the cause of anemia. Nutritional supplements. Use of nutritional supplements should be appropriately taught to the patient and the family because too much intake cannot improve anemia. Blood transfusion. Patients with acute blood loss or severe hemolysis may have decreased tissue perfusion from decreased blood volume or reduced circulating erythrocytes, so transfusion of blood would be necessary. Intravenous fluids. Intravenous fluids replace the lost volumes of blood or electrolytes to restore them to normal levels. 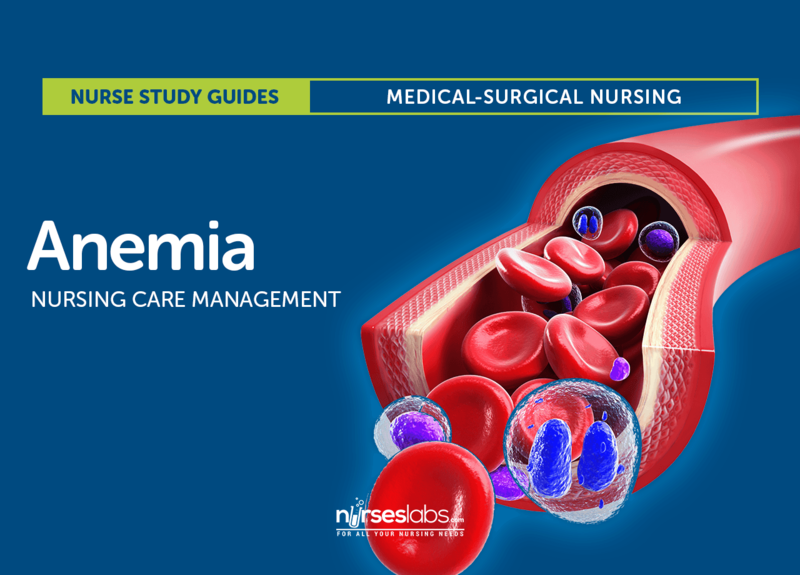 The management of anemia by nurses should be accurate and appropriate so that objectives and goals would be achieved. Health history and physical exam. 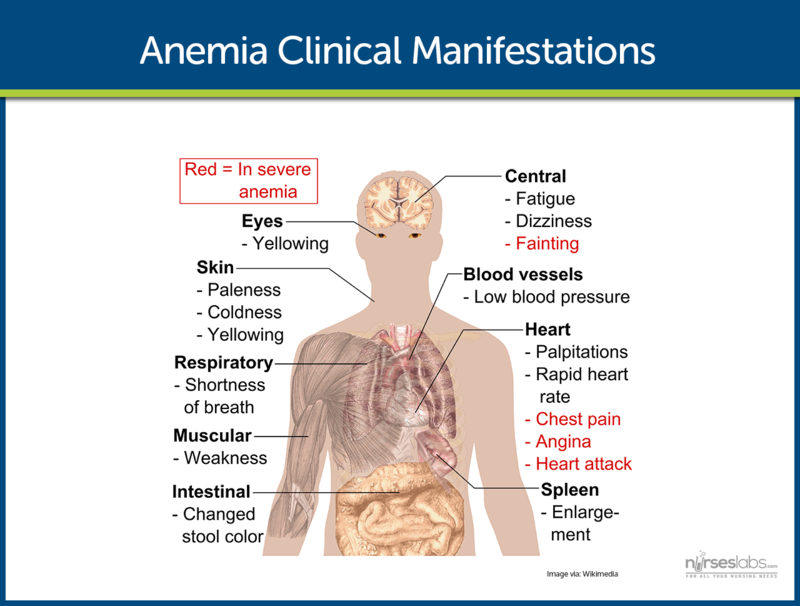 Both provide important data about the type of anemia involved, the extent and type of symptoms it produces, and the impact of those symptoms on the patient’s life. Medication history. Some medications can depress bone marrow activity, induce hemolysis, or interfere with folate metabolism. History of alcohol intake. An accurate history of alcohol intake including the amount and duration should be obtained. Family history. Assessment of family history is important because certain anemias are inherited. Athletic endeavors. Assess if the patient has any athletic endeavor because extreme exercise can decrease erythropoiesis and erythrocyte survival. Nutritional assessment. Assessing the nutritional status and habits is important because it may indicate deficiencies in essential nutrients such as iron, vitamin B12, and folic acid. Fatigue related to decreased hemoglobin and diminished oxygen-carrying capacity of the blood. Altered nutrition, less than body requirements, related to inadequate intake of essential nutrients. Altered tissue perfusion related to insufficient hemoglobin and hematocrit. Attainment or maintenance of adequate nutrition. Maintenance of adequate tissue perfusion. Nursing interventions are based on the data assessed by the nurse and on the symptoms that the patient manifests. Prioritize activities. Assist the patient in prioritizing activities and establishing balance between activity and rest that would be acceptable to the patient. Exercise and physical activity. Patients with chronic anemia need to maintain some physical activity and exercise to prevent the deconditioning that results from inactivity. Diet. The nurse should encourage a healthy diet that is packed with essential nutrients. Alcohol intake. The nurse should inform the patient that alcohol interferes with the utilization of essential nutrients and should advise the patient to avoid or limit his or her intake of alcoholic beverages. Dietary teaching. Sessions should be individualized and involve the family members and include cultural aspects related to food preference and preparation. Blood transfusion monitoring. The nurse should monitor the patient’s vital signs and pulse oximeter readings closely. Enhance compliance. The nurse should assist the patient to develop ways to incorporate the therapeutic plan into everyday activities. Medication intake. Patients receiving high-dose corticosteroids may need assistance to obtain needed insurance coverage or to explore alternative ways to obtain these medications. Attains and maintains adequate nutrition. Health education is the main focus during discharge and for the home care. Instruct the patient to consume iron-rich foods to help build-up hemoglobin stores. Iron supplements. Enforce strict compliance in taking iron supplements as prescribed by the physician. Follow-up. Stress the need for regular medical and laboratory follow-up to evaluate disease progression and response to therapies. Baseline and subsequent assessment findings to include signs and symptoms. Plan of care and persons involved. Client’s responses to teachings, interventions, and actions performed. Long-term needs, and who is responsible for actions to be taken. Let’s reinforce what you’ve learned with this 5-item NCLEX practice quiz about Anemia. Organ meats are rich in iron, which is needed for patients with iron-deficiency anemia.Option A: Fresh citrus fruits are rich in vitamin C that can boost the immune system. Option B: Milk and cheese are rich in protein that can strengthen the muscles. Option D: Whole grain bread are rich in carbohydrates that supply energy. Abnormality in the circulation of plasma. Decrease in the reticulocyte count. Defect in the erythrocyte count. Increased reticulocyte count is associated with hemolytic anemia.Option A: Abnormality in the circulation of plasma occurs because of the premature destruction of hemoglobin. Option C: Erythrocytes are being destroyed thus resulting in defect of erythrocyte count. Option D: Indirect bilirubin is elevated because the released hemoglobin is converted in large part to bilirubin. Ecchymosis is most common in anemia because blood vessels that are weak ruptures and results into ecchymosis.Option A: Bleeding gums is a symptom of idiopathic thrombocytopenia purpura. Option C: Fatigue is a sign of anemia but it is not a complication. Option D: Bilirubin concentration may be increased but not all results in jaundice. What is the hemoglobin level of a patient with anemia? A patient with anemia has decreased hemoglobin levels of 9 to 11 g/dL. Hypotension occurs in anemia because of hypoperfusion.Option A: Fatigue is a symptom of anemia as a result of decreased oxygenation. Option B: Dyspnea occurs in anemia because the body is starving for oxygen that should have been carried by hemoglobin in the red blood cells towards the body tissues. Option C: Decreased hemoglobin is one of the signs that form the diagnosis of anemia. A. Abnormality in the circulation of plasma. B. Decrease in the reticulocyte count. C. Defect in the erythrocyte count. 4. What is the hemoglobin level of a patient with anemia? A. 21 to 25 g/dL. B. 14 to 16 g/dL. C. 9 to 11 g/dL. D. 35 to 40 g/dL. Organ meats are rich in iron, which is needed for patients with iron-deficiency anemia. Option A: Fresh citrus fruits are rich in vitamin C that can boost the immune system. Option B: Milk and cheese are rich in protein that can strengthen the muscles. Option D: Whole grain bread are rich in carbohydrates that supply energy. 2. Answer: B. Decrease in the reticulocyte count. Increased reticulocyte count is associated with hemolytic anemia. Option A: Abnormality in the circulation of plasma occurs because of the premature destruction of hemoglobin. Option C: Erythrocytes are being destroyed thus resulting in defect of erythrocyte count. Option D: Indirect bilirubin is elevated because the released hemoglobin is converted in large part to bilirubin. Ecchymosis is most common in anemia because blood vessels that are weak ruptures and results into ecchymosis. Option A: Bleeding gums is a symptom of idiopathic thrombocytopenia purpura. Option C: Fatigue is a sign of anemia but it is not a complication. Option D: Bilirubin concentration may be increased but not all results in jaundice. Hypotension occurs in anemia because of hypoperfusion. Option A: Fatigue is a symptom of anemia as a result of decreased oxygenation. Option B: Dyspnea occurs in anemia because the body is starving for oxygen that should have been carried by hemoglobin in the red blood cells towards the body tissues. Option C: Decreased hemoglobin is one of the signs that form the diagnosis of anemia.